I had my first midwife appointment here today, up in Rexburg with Seasons Medical. Mom went with me. She spent a lot of time just talking to me, asking about my medical history, explaining her credentials and answering any questions- about an hour long visit. I wasn't able to get an ultrasound but I will be tomorrow! YAY :D Even though I get to see him more than most women I always love seeing him happy and healthy and just moving around. Before we went to the midwife's office we stopped at a thrift store and looked at some baby things.... we found a lot of cute things, here's one of my favorite finds! 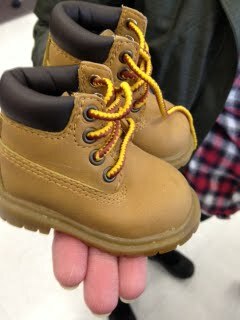 Adorable little boots, they reminded me of Daddy :) I got some other things too, a little Ralf Lauren sweater vest and some adorable button ups and cute pants. 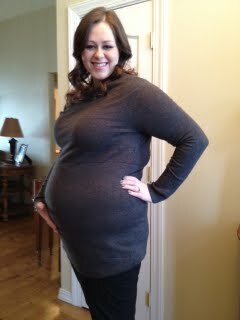 ---> Prego pic 21 weeks, I look goooofy! Precious shoes!! Tear. You look great! Are you doing a homebirth??? Or just having a midwife with you at the hospital? Natural then?? Either way is so neat. I confess, next time (YEARS down the road), I'd love to have a midwife and have the baby at home. I like how midwives are so personal and spend a lot of time with you, instead of the 10 min doctor appointments that are the norm. No, no home birth, delivering in the hospital for sure. I have thought about going all natural but the unknown of my first coupled with the possibility of Danny not being there... I plan on holding off for as long as I can and getting an epidural. The mid wife spent over an hour with me! I can't tell you how much better the care here has already been! So glad i'm going to have him here.